A Soyuz rocket stands poised to launch the Progress 21 cargo ship towards the International Space Station in an April 24, 2006 launch. A Russian cargo ship packed with newequipment, fresh food, golf tools and crustaceans blasted intospace Monday on a two-day trek to the International Space Station (ISS). The unmanned - but not lifeless -Progress 21 supply ship rocketed into orbit atop a Russian-built Soyuz boosterat 12:03 p.m. EDT (1603 GMT) from its Baikonur Cosmodrome launch pad in CentralAsia's Kazakhstan. "The launch was a standard one," aspokesperson for Russia's Federal Space Agency told the InterfaxNews Agency just after liftoff. Progress 21 is delivering more than2.5 tons of food, water, new science equipment and spare parts to the spacestation, where ISSExpedition 13 commander Pavel Vinogradov and flightengineer JeffreyWilliams are awaiting the space freighter's arrival. 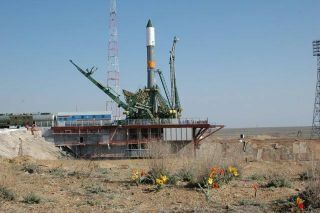 The spacecraft isexpected to dock at the ISS on April 26. About 5,040 pounds (2,286 kilogram)of cargo sit inside Progress 21, including 661 pounds (299 kilograms) of water,over 100 pounds (45 kilograms) of air and oxygen, and almost 2,360 pounds(1,070 kilograms) of dry supplies. More than 1,900 pounds (861 kilograms) ofpropellant to maneuverthe space station is also aboard the spacecraft. The space freighter also included abatch of crustaceans as part of an experiment dubbedAquarium, which is aimed at studying the stability of closed ecological systemsin station's microgravity environment, NASA officials said, adding that theexperiment could provide information and insights for future long-durationspace missions. About 26 pounds (12 kilograms) of freshvegetables, fruits and melted cheeses are also on Progress 21's cargo manifest,along with new movies, music CDs, books, Russia's Federal Space Agency said. Rounding out Progress 21's supplyshipment are a golf tee and bag for a club and ball already in orbit, which Vinogradov is expectedto use during an upcoming spacewalk as part of an agreement between theFederal Space Agency and Canada-based Element 21 Golf Co., NASA said. Russian flight controllers pipedcoverage of the Progress 21 launch up to Vinogradov via a radio link during the space shot. On Tuesday, Vinogradovwill begin working with the Telerobotically Operated Rendezvous Unit (TORU) inside thestation's Russian-built Zvezda module. TORU is a backup system that will allow Vinogradov to take control of Progress 21 remotely in caseits automateddocking system fails. Progress 21 is scheduled to dock atthe aft end of the space station's Zvezda service module at1:40 p.m. EDT (1740 GMT) on April 26. A previous cargo ship - Progress 20- is also docked at the ISS after a Dec. 23, 2005 arrivalat the station's Russian-built Pirs docking compartment. It will discarded in mid-June, NASA officials said. NASA TV will broadcast the Progress21's final ISS approach and docking live beginning at 1:00 p.m. EDT (1700 GMT).You are invited to follow along with the cargo ship's docking using SPACE.com's NASA TV feed by clickinghere.